Don’t let a solar system deter your home buying experience. 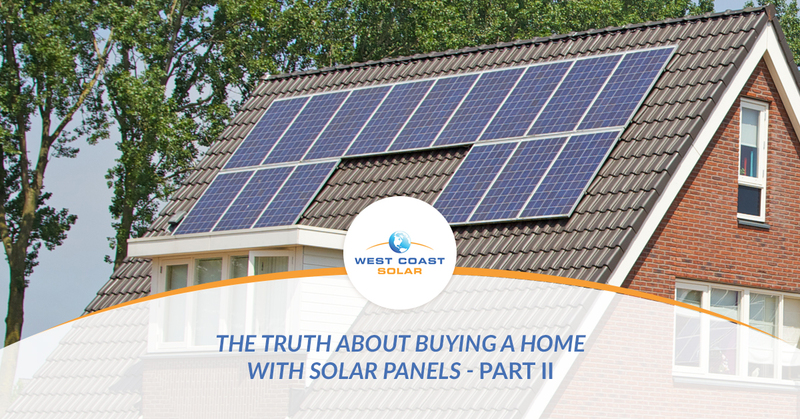 A home with solar panels already installed is a huge benefit to most homebuyers. However, it’s important to understand how the system is being financed. In part one of this blog series, we discussed paid-in-full and leased systems, and in part two, we will share with you two more scenarios you may encounter while searching for a new home to purchase. Your decision to acquire solar panels through purchasing a home should be financially and personally advantageous to the homebuyer. West Coast Solar believes that renewable energy sources like wind, solar, hydro, and more are the future of our energy consumption. The use of solar power offers many benefits like saving money, helping the environment, and becoming energy independent. If you’re searching for a home with an installed solar system, make sure and review the four possible financing scenarios mentioned above. You can take green energy a step further with your potential home purchase and request a home energy audit. A professional will inspect the house for its ability to use and conserve energy efficiently across the appliances, structure, and the solar power system. Your potential home purchase price may include the solar panels on the roof. In most cases, the home seller will include their loan-financed solar system in the asking price to relieve themselves of the fiscal responsibility. If you’re looking to buy a home with a solar system financed through a secured or unsecured loan, the payments are the home seller’s responsibility. You will not be responsible for making the payments on the loan. However, make sure and ask if the balance due on the solar system is included in the asking price of the home. If the price makes sense, move forward with the home purchase, but if the price doesn’t fit your budget or is above market price, consider other options. Solar Panels financed through the Property Assessed Clean Energy program are a great option for any given property to utilize renewable energy. The PACE program attaches the solar system to the property, which means payments are made for the system through property taxes. The homeowner who opted to install the panels on the property is not responsible for the payments. If you will be the new homeowner, you will then be responsible for the tax payments. Discuss the added cost to your property taxes with your financial advisor to ensure the purchase of a new home is still within range of your budget. At first glance, the added tax payments for a PACE financed solar system may seem unattractive at first; however, the savings you will incur over time on your electricity bills will offset this extra property tax cost. Make sure and review the financing terms of the PACE financed solar system. You want to ensure your ability to keep up with the payments while you take advantage of the solar system. If you’ve just purchased a new home, congratulations! West Coast Solar is excited for you. Does your new home have a solar power system? If not, give us a call today, and we will work to design the best solar energy system for your new home. West Coast Solar has served clients in 21 counties between Sacramento, San Jose, and the greater Bay Area for more than a decade. Call the solar power experts today! If you missed part one of this blog series, read it now!